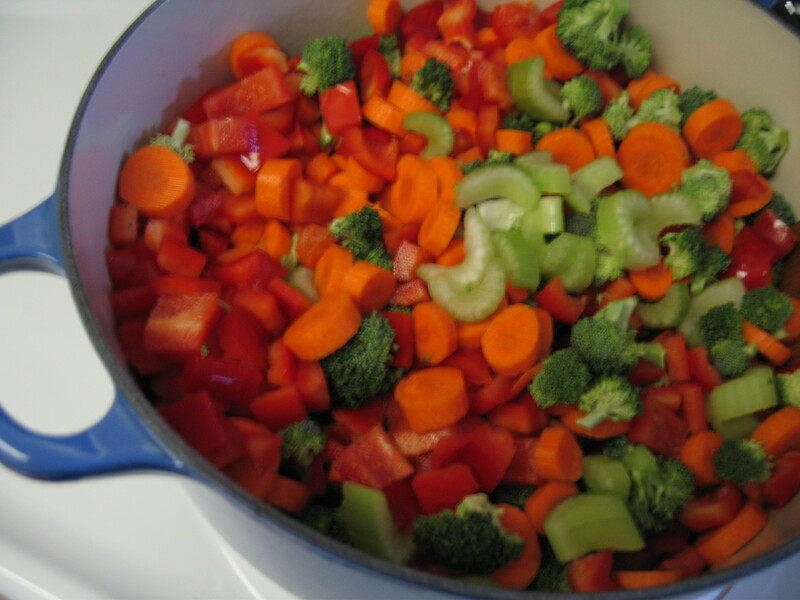 An eye-pleasing foundation to my Mexican Chicken Soup: celery, broccoli, carrots, red bell peppers and garlic. Pretty to look at, healthy for my body and tastes delicious! You’ve just finished a fun dinner with friends and can’t possibly think about eating any more… that is, until you are presented with the dessert tray–a glorious presentation of apple crisp, pumpkin pie and brownie sundae topped with hot fudge sauce and candied walnuts. You order dessert, even though you are full, and finish every last bite. You’ve just experienced the strength of eye hunger, one of eight hungers we possess, compounded by your nagging inner critic (does that dude EVER take a break?). The typical American will gain 5-7 lbs over the holidays and eye hunger has a lot to do with that, so let’s explore why this little booger hampers our holiday bliss and what we can do to keep our eye hunger working for us and not against us. First, let’s define it: Eye hunger is when you become hungry looking at food (via in person, on TV or in a magazine) or reading a recipe, even if you just ate. Many studies have proven that our eyes will override our mouth, stomach and body. For instance, subjects at a movie theater who were given stale popcorn ate it just because it was there and they could smell it. It didn’t even matter that it tasted awful. So, over the holidays when you are surrounded by mounds of delicious turkey, mashed potatoes and caramel pecan pie slices, use these helpful tools to satisfy your eye hunger without eating double and feeling miserable. 1. Create beauty. Our eyes appreciate beauty, so use pretty plates, napkins and table decor. 2. Surround yourself in beauty. Get out in nature, savor your favorite piece of art, look at pictures of your beloved, listening to soothing music. 3. Cook and eat food of various colors, textures and shapes. Arrange it beautifully on plates and bowls. It takes just as much time, but with a little extra thought, it can make a huge difference in improving your food relationship (and health). 4. Use a small plate. Fill half of your plate with vegetables, a 1/4 with protein (meat or vegetarian based), an 1/8 with starch (potatoes and grains) and an 1/8 with healthy fats (you can also skip the starch if you have diabetes, Celiac disease, etc.). If it is a holiday or special occasion where dessert is served, consider sharing your dessert with one or two people. Or consider a healthier dessert such as dark chocolate dipped strawberries. Ummm… yes please! Now it is your turn! The next time you buy groceries, practice purchasing vegetables of every color to ensure eye satiety (green, orange, red/purple and yellow/white). If you don’t eat a lot of vegetables, then do it with fruits and vegetables such as making a roasted vegetable salad with broccoli, carrots and cauliflower served with a protein and eating red grapes for dessert. Now that’s a feast to behold! If you missed part 1 of this series, check it out here!